New Delhi, July 27 2014: No matter how much you analyze it and how many times you revisit it, the epic story of Mahabharata does not stop fascinating. Theatre personality Atul Satya Koushik’s play ‘Chakravyuh’ is yet another attempt to reinterpret the mythology of India’s greatest war. Staged today at the Kamani Auditorium, ‘Chakravyuh’ is a presentation of The Films and Theatre Society, a prominent theatre group based in Delhi. Directed by Atul Satya Koushik, the play reboots the tragic story of Arjun’s young son Abhimanyu in a new avatar. However, for the lovers of this grand epic, it was a redux of a different kind. 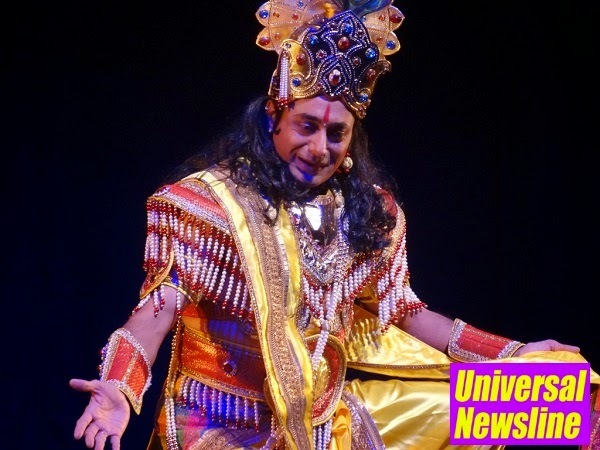 Actor Nitish Bhardwaj who became a household name after playing ‘Krishna’ in B R Chopra’s tele-series Mahabharata almost 25 years ago, marked his return in the much-loved role, vowing the audience with his enchanting character. The play which was earlier staged in Lucknow, will now go to Gurgaon on August 3 as part of The Films & Theatre Society’s pan-India tour of plays, called Swades, which will cover several states including Rajasthan, Himachal Pradesh and Punjab. “When I redesigned my original play ‘Arjun Ka Beta’ as ‘Chakravyuh’, the character of Krishna came out really well. While narrating the script to my team, it suddenly struck me that there is no one else but Nitish who can add life to this role. And here he is holding the flute yet again, manning Arjun’s chariot,” says Koushik, the writer and director of the play. Chakravyuh is an adaptation of Koushik’s much acclaimed play ‘Arjun ka Beta’ and makes Abhimanyu’s glorious battle against seven great Kaurava warriors, a metaphor for life. With little chances of surviving, the young Abhimanyu sticks to his karma, fighting valiantly and being recognized as the most glorious martyr of the epic war. After much destruction and bloodshed, Krishna turns up with a sermon that intends to answer many a question raised by the characters - from Arjun’s frustration of losing his young son, to Draupadi’s vexation about not being the mother of a martyr to Yuddhistir’s perpetual agony on fighting his own kin. “One can never take away an actor from a person,” says Bhardwaj, who took a break from acting to pursue politics in the 1990s. “It is great to reprise the role again but I have been a little nervous as I do not want to disappoint my fans at any cost,” says the actor, who is not new to theatre. Nitish had performed in six Hindi and Urdu plays during late 1980s. The actor recently made his directorial debut through Marathi feature film Pitruroon starring yesteryear actress Tanuja and renowned actor Sachin Khedekar. Apart from his stage comeback, Nitish is also awaiting the release of his Hindi film Yaksha directed by Mukul Abhyankar in which he plays the title role.